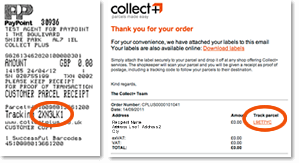 If you purchased the label from the CollectPlus website, you'll find your CollectPlus tracking reference in the email we originally sent to you. You can also find this on the receipt our storekeeper gave you when you dropped off your parcel. If you create an account with using the email address you use to buy labels you will have a view of all your CollectPlus labels. You will also get progress information on your parcels from retailers on our Click & Collect service. If a retailer has supplied you with a label to return an item you will only be able to confirm the tracking reference from the receipt the storekeeper gave you when your parcels was taken to the store and scanned in. For any other queries please check with the retailer directly.